Modern modular kids furniture [with no screws]. Problem with bunk beds currently for sale is that they are either too expensive, too bulky, (or they are not the most engaging pieces of the furniture to look at in the kids room). This bed is completely free for non-commercial use, the only cost is your time and materials – it's that simple! Do-it-yourself type? Totally get ya! Grab all the files you'll need to get started from the Downloads section. Don't have shop access? Worry not! Order all the pre-cut and pre-finished pieces straight to your doorstep. Assembly requires no tools. Entire family can partake in this fun process! For safety, disassembly requires pliers. 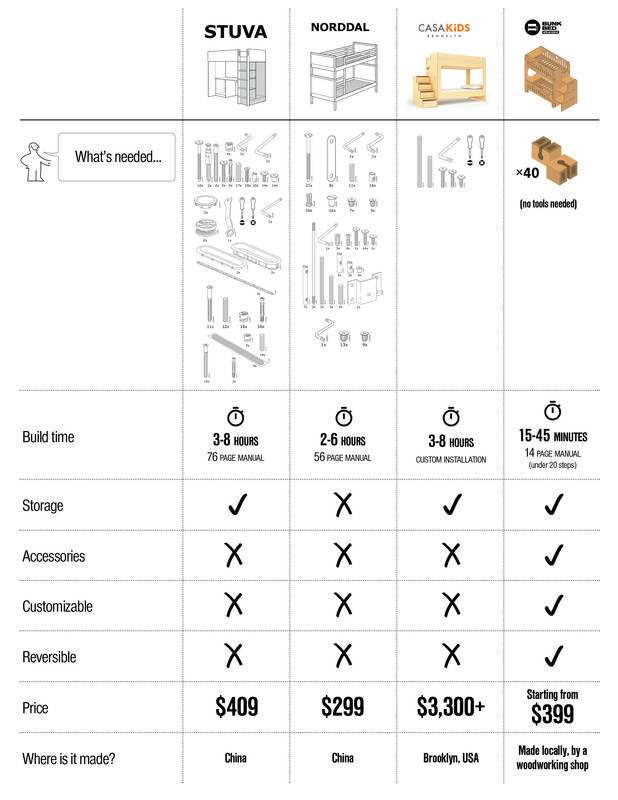 For those who've built IKEA furniture, assembly takes 15 minutes. For everyone else, about half an hour. This bed is as beautiful as it is functional. Stairs can fit books up to 12" tall or house drawers for extra toy storage. Make your bed more useful by adding two spill-safe night tables. Slide these anywhere along side rails. No bedroom is complete without ambient light. Use 3D-printble clips to mount LED light strips. From various wood types and finishes, to customizable panel designs. Make this bed truly yours! Unique design of this bed allows for stairs to be either on the right or the left side – simply flip a few panels! “Making the bed” takes on a whole new meaning thanks to the oversized frame. No more stabbing fingers! From design, to materials, to fabrication, this bed is proud to be created in the beautiful San Francisco bay! Kids are able to build their own bed, learning important lessons in ownership, responsibility, and craft. At only 71.5"(L) × 62"(H) × 32.5"(D), this is the most compact crib bunk bed that features a full staircase! Simple design thinking creates for one of the toughest crib bunk beds, able to support adults! Interested in re-selling? Get in touch via Facebook! Bunk bed with no screws idea, website, code, and photography by Yuriy Sklyar ( ). Big thanks goes out to Gian Pablo. Please use this bed at your own risk. Free for personal, non-commercial use. Get in touch for commercial inquiries.